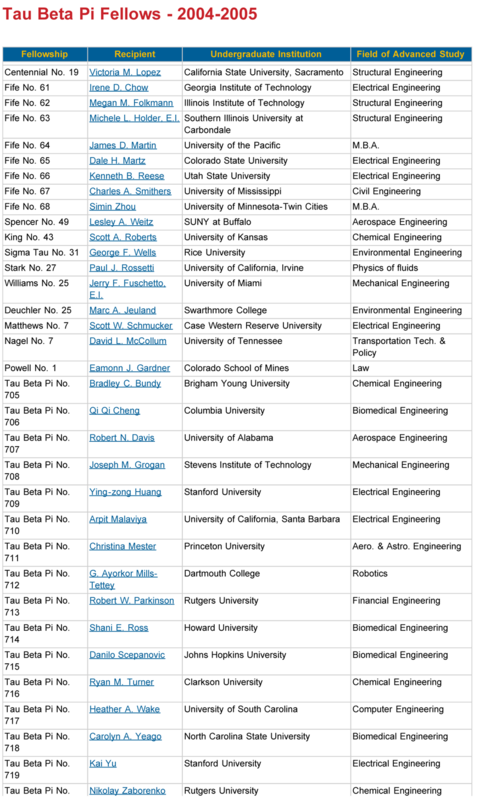 The Fellowship Program is Tau Beta Pi's single most important project for the advancement of engineering education and the profession. It is a time-proven idea which was pioneered by Tau Beta Pi in the honor-society field. The plan was adopted by the 1928 Convention as a result of the recommendation and labors of President A. D. Moore. Since the beginning, the purpose has been to finance, for a select group of members chosen for merit, a year of graduate study at the institutions of their choice. A distinguishing feature of Tau Beta Pi fellowships has always been that they are as free of binding rules as possible. Tau Beta Pi fellows are free to do graduate work in any field which will enable them to contribute to the engineering profession. The only specific duty of awardees is to write a report at the completion of the fellowship year summarizing their work. Click here to register and receive a Fellowship application. Deadline is 11:59 P.M. (EDT) February 1, 2019.